Thomas G. West has known for over 20 years what has since been gradually recognized by other cognitive scientists: dyslexia has an upside. Not only this, but the special abilities of many dyslexics are desperately needed in the world today. What has been traditionally deemed a disability is a different wiring of the brain—one that once worked exceptionally well and might be coming into its own again. 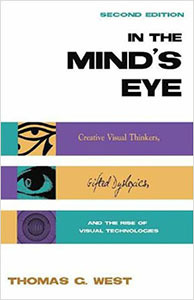 West explores the problems and opportunities of dyslexia and the important role of visual thinking in an updated version of his wonderful book In the Mind’s Eye: Creative Visual Thinkers, Gifted Dyslexics, and the Rise of Visual Technologies, Second Edition (2009). For some four hundred or five hundred years we have had our schools teaching basically the skills of the medieval clerk—reading, writing, counting, and memorizing texts. Now it seems that we might be on the verge of a new era, when we will wish to, and be required to, emphasize a very different set of skills—those of a Renaissance man such as Leonardo da Vinci. With such a change, traits that are considered desirable today might very well be obsolete and unwanted tomorrow. In place of the qualities desired in a well-trained clerk, we might, instead, find preferable a habit of innovation in many diverse fields, the perspective of the global generalist rather than the narrowly focused specialist, and an emphasis on visual content and analysis over parallel verbal modes. What computers can’t do well—see the whole, rather than a collection of parts—is a human skill, especially of visual thinkers. What is visual thinking exactly, and how does it relate to pattern recognition? We who work with information to find and understand the stories that dwell within, especially visual analysts, keenly recognize the importance of these skills. The ability to see how things connect to form complex systems, how they influence one another in a subtle dance of interaction, is imperative if we hope to solve the big problems that plague us today. These big problems, in many respects, have emerged because of our focus on parts while ignoring the whole—the fallout of specialization. Everyone agrees that we have a problem. Our technological culture is drowning in its own success. Masses of data and information are accumulating everywhere. Up to now, the basic strategy for dealing with these growing masses of information has been long, mind-numbing education and reckless, blinkered specialization. That this strategy has been effective in a great many respects, so far, there can be little debate. The problems we are discussing are a tribute to its ample and abundant success, so far. However, after long success, it is becoming increasingly clear that this strategy may be entering a phase of diminishing return. It has long been recognized that this strategy has always had built-in problems. The more one knows in one’s own, increasingly narrow area, the more one is ignorant in other areas, the more difficult is effective communication between unrelated areas, and the more unlikely it is that the larger whole will be properly perceived or understood. Like the student who reads too much small print, the specialist’s habitual near focus often promotes the myopic perspective that precludes the comprehension of larger, more important patterns. The distant view of the whole is blurred and unclear. If you focus only on a small group of stars at the edge of the Milky Way, you will not perceive the larger structure of the whole galaxy of which the group is one tiny part. The specialist strategy breeds its own limits. Pieces of the puzzle in separate areas remain far apart, or come together only after decades of specialist resistance, or success in one area leads to great problems in another. Material abundance produces waste-disposal problems; cars and aircraft produce wonderful mobility for many people, but also deplete resources, produce accidental fatalities, and increase pollution; success in vaccination, hygiene, and health care lead to all the problems of great concentrations of human population. In collaboration with visual thinking skills, visualization technologies have an important role to play in solving the big problems of today. Graphicacy is no longer the sole realm of artists and architects. Graphical skills and technologies are now essential to our survival. My son is dyslexic. His letters overlap and reverse. Is there anyway you can introduce this book to colleges and high schools. Some students depend strictly on academic knowledge provided by the schools and may not realize that they do have a place in the employment world. A warning schools do not use the word dyslexic because of the cost of accommodations for these students. It is hidden under reading and writing challenges. I like these ideas as my issues with writing and verbal communication have been a blessing which has pushed me towards designing graphical visualizations. On a completely different note, Temple Grandin literally memorized the pictures that her mother showed her as she fought through her early days of autism. When interviewed today, Ms. Grandin will tell interviewers to “Google me”…..this prompts her to bring up those visuals that her mother taught her and others that have become part of her adult life. This is great! Another great book to take a look at is called The Gift of Dyslexia: Why Some of the Smartest People C. by Ronald D. Davis.